Velikost predogleda PNG datoteke SVG: 800 × 400 točk. Druge ločljivosti: 320 × 160 točk | 640 × 320 točk | 1.024 × 512 točk | 1.280 × 640 točk | 900 × 450 točk. 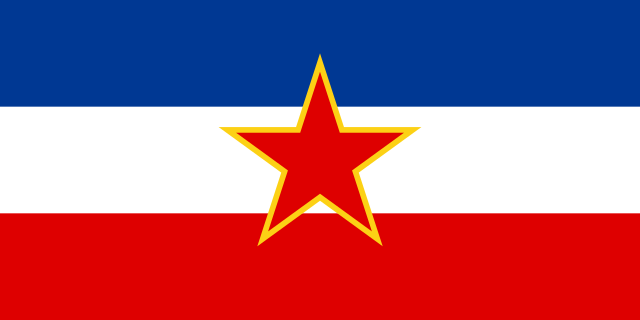 trenutno 19:07, 1. marec 2019 900 × 450 (381 bytes) FDRMRZUSA Corrected centering and proportions imperfections for "red star". Optimized svg code. No other changes. 20:03, 21. februar 2019 900 × 450 (387 bytes) FDRMRZUSA Higher svg resolution from same file (latest version): resized by "Inkscape". Corrected "star" position according to flag construction sheet at [https://fotw.info/flags/yu_fy.html] ("Flags of the World"): star width 1/3 flag width and "...In this way the top point of the star would reach exactly the middle of the blue stripe, while the lower two points would not reach that far, but accordingly less.". Optimized svg code. No other changes. 20:34, 1. maj 2018 600 × 300 (572 bytes) CentreLeftRight Reverted to version as of 13:25, 1 May 2018 (UTC): No consensus on change:  An image of this importance requires general agreement amongst editors and/or a reliable source. A Serbian tabloid is not a reliable source. 02:59, 1. maj 2018 600 × 300 (572 bytes) CentreLeftRight Reverted to version as of 20:04, 2 March 2017 (UTC): No consensus on change.